I fell in love with this velvet throw while browsing through the Layla Grayce website. It's called the Bella Notte Throw Blanket. It is made of 100% cotton velvet with a satin ruffle trim. It just looks so luxurious and elegant. 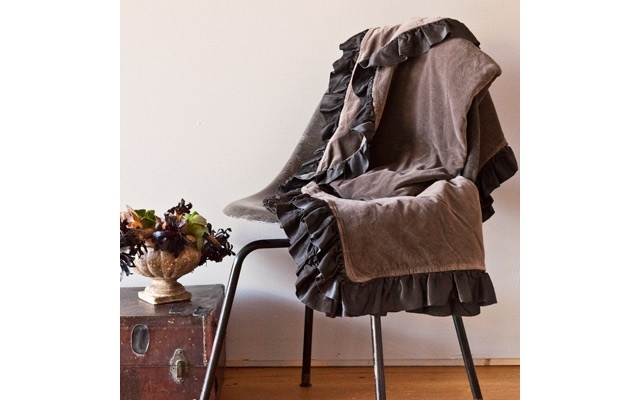 This ruffled throw retails for $372, so it will need to wait for a day when I no longer have young children in the house who have a tendency to be sticky and to spill things. It is currently available in 15 different colors with coordinating ruffled trim, but I love the color shown, which is the Fawn. If you haven't stopped by recently, you definitely should checkout Layla Grayce's newly redesigned website along with the revamped Backroom Blog. Both are always wonderful sources of inspiration for gift-giving and home decor.